However, contrary to Friedman’s praise, Energiewende has been an utter failure. Germany’s feed-in tariff was established in 1991 as part of the Electricity Feed-in Act. The law mandates that renewables “have priority on the grid and that investors in renewable must receive sufficient compensation to provide a return on their investment irrespective of electricity prices on the power exchange.” This means utilities are forced to buy electricity from renewable sources at above market rates— regardless of whether or not it is needed. The feed-in tariff was extended for another 20 years in 2000. Expanding on these subsidies, German Chancellor Angela Merkel officially established the Energiewende in 2010. The plan includes policies such as emission reduction targets, new energy taxes, and continuing the feed-in tariff system. If Germans aren’t benefitting from Energiewende, then who is? As the IER study points out, the feed-in tariff is a lucrative subsidy for renewable energy producers. For example, in 2009 the feed-in tariff price for photovoltaic solar was eight times more than the wholesale price of electricity. At the outset of Merkel’s Energiewende policy, nuclear energy was to play the role of a “bridge” between coal and renewables. However, after the 2011 Fukushima Daiichi nuclear meltdown in Japan, Chancellor Merkel immediately shut down eight of Germany’s nuclear reactors. In the absence of nuclear power, the country has increasingly relied on coal power to back up intermittent and unreliable power from wind and solar. 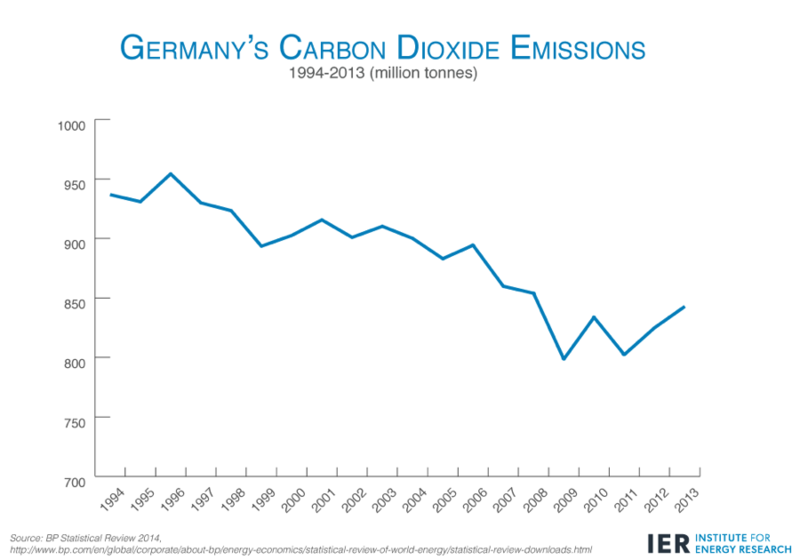 Ironically, this has led to an increase in carbon dioxide emissions since 2011, which contradicts the stated goal of Energiewende. Unfortunately, many of the failed policies of Germany have already taken root in the United States. In 2013 alone, U.S. taxpayers subsidized the wind industry to the tune of $5.9 billion, while the solar industry received $5.3 billion. Additionally, federal and state policies threaten to shut down 130 gigawatts of reliable power from natural gas, nuclear, and coal. That’s enough power to meet the residential electricity needs of 105 million Americans. Of course, American families are watching their electricity bills increase as a result—although not quite to the same extent as Germany’s. Germany’s Energiewende is not making it a “Green Superpower,” as Thomas Friedman puts it. In fact, these policies are harming Germans by raising electricity rates and pushing jobs to lower-cost countries. Transitioning from affordable and reliable energy to expensive and unreliable energy is nonsensical. Simply put, the German model is one to be avoided—not emulated.